Preceding these intercommunal clashes, south Jonglei was also witness to violent conflict between the South Sudan Army (SPLA) and the David Yau Yau armed militia group, which forced an estimated 120,000 people to flee into the bush of Pibor county. Since July 14th, complementary surgical teams from Médecins Sans Frontières and the International Committee of the Red Cross (ICRC) have been providing emergency care to patients arriving from Manyabol in the hospital in Bor. Meanwhile, another Médecins Sans Frontières emergency team is attempting to reach the tens of thousands of people hiding in unsafe, malaria-infested swamps, without access to safe drinking water, food, or medical care. Today, a Médecins Sans Frontières team is being dispatched to an area south of Pibor town to provide first aid to these people and assess additional emergency medical needs. “They are afraid to seek medical care in towns so it is essential for us to intervene where they are so that all those in need can access treatment,” said John Tzanos, head of the Médecins Sans Frontières team in Pibor County. Earlier this month, the team assessed other areas and set up a small clinic in Boma town, the scene of intense fighting over the past month. Médecins Sans Frontières also continues to run a primary health post in Gumuruk, which is now the only health-care facility in the county after the Médecins Sans Frontières hospital in Pibor town was targeted and destroyed in May. The levels of assistance remain far below the needs of the population in many areas. Médecins Sans Frontières is still extremely concerned about the impact the current violence could have on the local population a­nd urges all parties to respect and facilitate deployment of humanitarian assistance all over Jonglei State. Médecins Sans Frontières has been working in Jonglei state since 1993 and is currently providing primary and secondary healthcare through its health centres in Pibor, Uror and Nyirol counties, as well as emergency medical care when required in response to outbreaks of violence. 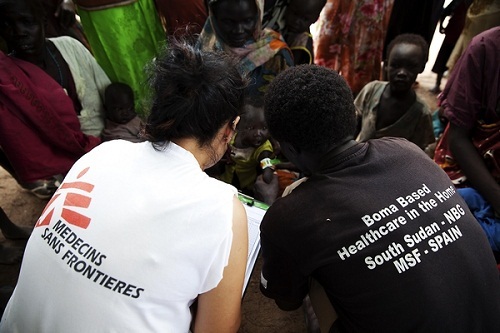 In 2012, Médecins Sans Frontières provided 130,692 outpatient consultations in Jonglei state.